If you are utilizing the power of technology with SAP S/4HANA Cloud it is beneficial for you to complete your registration for SAP Learning Hub so you can join the following new meet the expert sessions. These live webinars are included in your SAP S/4HANA Cloud Enterprise Support subscription. Please note the following: To access SAP Learning Hub, edition for SAP Enterprise Support, a one-time registration is required. A detailed step-by step guidance can be found here. 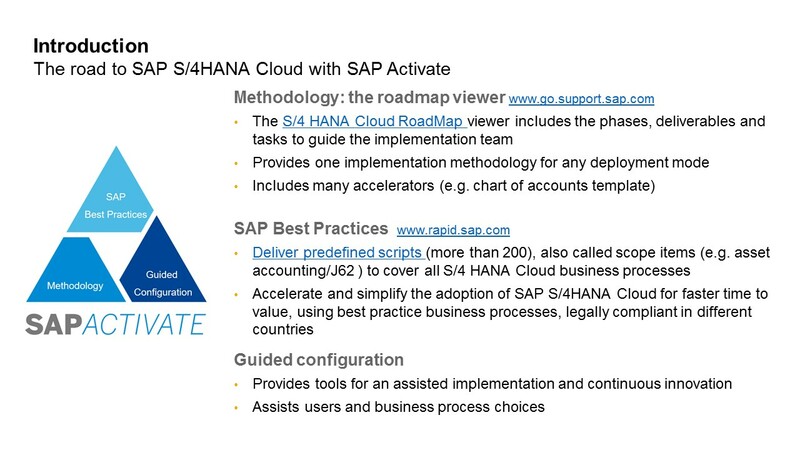 SAP Activate is a framework which defines how to implement an SAP S/4HANA solution, and consists of three main components (Methodology, SAP Best Practices and Guided Configuration). This webinar will show you the three components in the context of an SAP S/4HANA Cloud implementation. 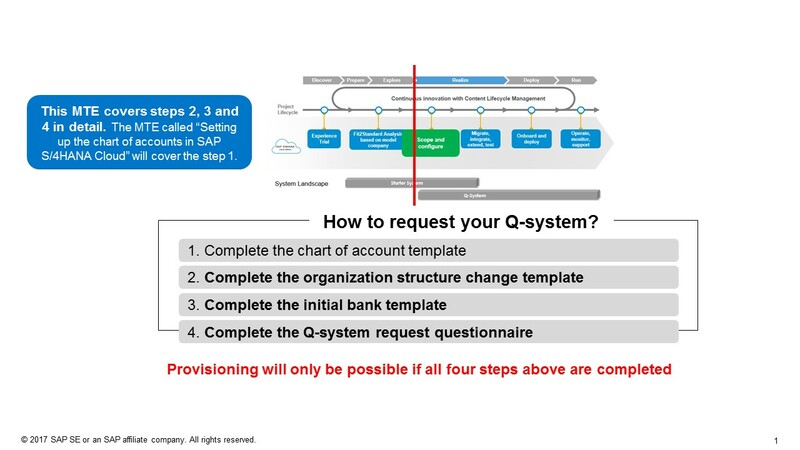 During your SAP S/4HANA Cloud implementation, at the end of the explore/fit-to-standard phase, you will need to request provisioning of your quality system. One of the critical steps of requesting your Q-system is the setting up of the chart of accounts. This webinar will show you in detail the process of setting up the chart of accounts in SAP S/4HANA Cloud (1711). 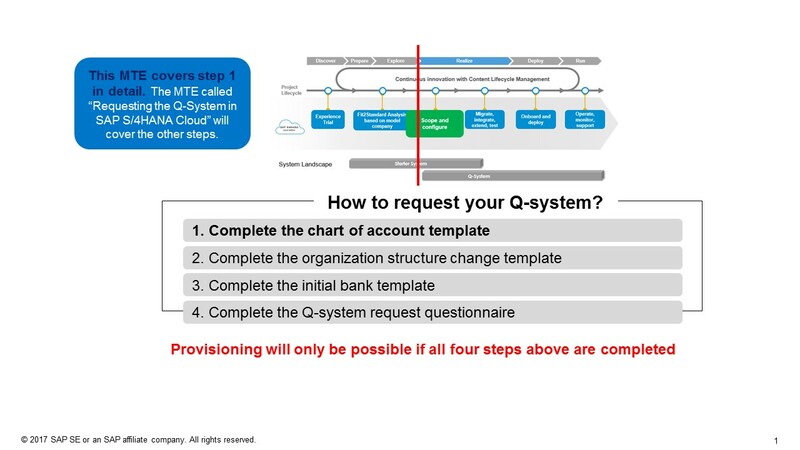 During your S/4HANA Cloud implementation, at the end of the explore/fit-to-standard phase, you will need to request provisioning of your quality system. There are four critical steps that need to be completed. This webinar will show you in detail the process of completing the following templates: organization structure, initial bank, and Q-system questionnaire. 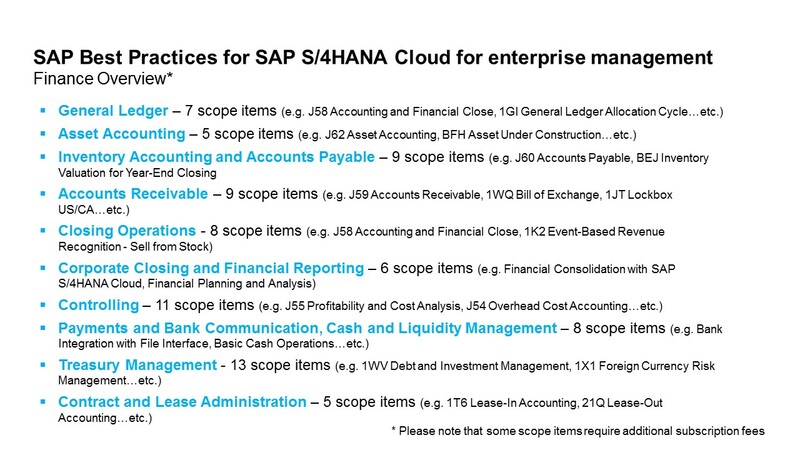 During implementation of SAP S/4HANA Cloud for enterprise management, you will be implementing some finance scope items. This webinar will show you an overview of SAP S/4HANA Cloud Finance.